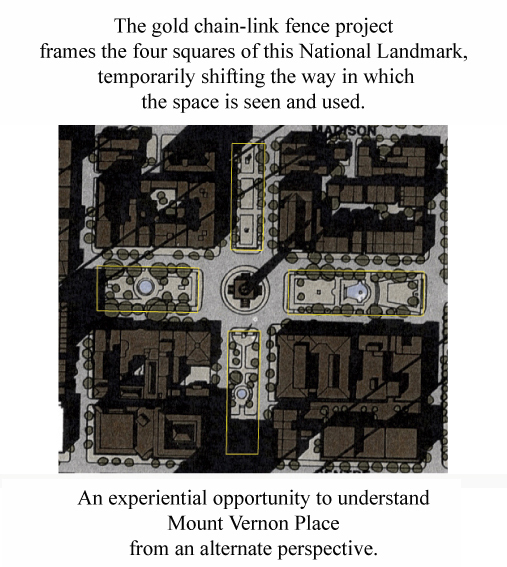  Animation: A virtual tour of Mount Vernon Place and the 'Framing Mount Vernon Place' project.  Photos: Twelve albums of photos in chronological order capturing the before, during, and after the fence.  Video: A ten minute rough cut video that documents the project Pre - Installation. The clip was originally screened in Mount Vernon Place on April 26th, 2008.  Voice Mail Message: Click to listen to a few voice mail messages left on my phone during the project.  Press: The 'Framing Mount Vernon Place' press references consisted of television news reports, newspaper articles, N.P.R stories, editorials and blog reviews. Unfortunately, The Baltimore Sun limits viewing articles to thirty days and back orders are on the way and will be scanned for archive. For now please Click here for one sample or visit other online news or blog sites such as The Huffington Post. The press was a major force in this project and plays an incredible role in the perception of such public works of art.  Blog: Read the last 20 of 100+ pages recorded onto this web site by the public/viewers during the course of 'Framing Mount Vernon Place'.  A public dialogue billed 'Beyond Golden Fences' took place this past September 13th as part of the 2008 Waverly Book Fest, at the Waverly Enoch Pratt free Library.. Language is a constant struggle and so after a rocky beginning the discussion got really good. Thanks to the curious, interested, engaged, and patient folks who were apart/a part of a great conversation, it made my day.  On Saturday, March 29th 2008, the gold chain link fence frame around Mount Vernon Place was dismantled as Jonathon Taube brought his 'Baltimore Sweep Action Parade' into the center of Baltimore at Mount Vernon Place. We couldn't have asked for better weather and it was a great OPENING for Beyond the Compass, Beyond the Square the temporary public exhibition. Head outside to the park and enjoy.  Early Thursday morning, March 27th 2008, several panels were found laying in the flower bed on the north side of the east square at Mount Vernon Place. Because of the seemingly constant and escalating situations, I was asked to take down the entire fence surrounding the east square. In keeping with the symmetry of Mount Vernon Place, a decision was made to dismantle the west quadrant as well . In both of these squares the fence panels were stacked in secure and symmetrical piles accordingly with the original plans. The east and west sections of the park now contrast the north and south, and as Mount Vernon Place is divided yet again please take this as an opportunity to experience and consider another change of this historical park.  As spring starts the so called "construction fence" references the changes occurring inside and outside of Mount Vernon Place. The flowers are blooming inside the park while new sidewalks are underway all the way down Charles St beginning at the intersection outside of the north quadrant. Charles street is divided right down the middle marked by brilliant fluorescent cones screaming there are things to be seen and links to be made as the cherry blossoms are almost ready to be re-vailed in full bloom.